Empowering children to speak up and then listening to what they have to say – it’s one of the most effective ways to advocate for the rights of youth. Four students from UNB’s Renaissance College in Fredericton are helping the New Brunswick Child and Youth Advocate’s Office (CYA) do just that. Lawyers and social workers at the CYA work to ensure that New Brunswick institutions and policies are in accordance with the United Nations Convention on the Rights of the Child. For the past seven months, Renaissance College students Kody Carlson, Nadine Pelletier, Travis Daley and Dakota Colford have been working with the CYA to research and report on best practices for youth-run youth advisory committees, presented recommendations created by youth for youth. 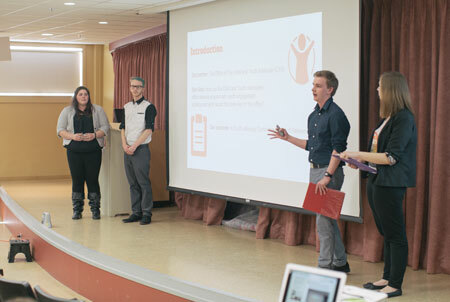 The four UNB students are enrolled in UNB's Community Problem Solving capstone leadership at course at Renaissance College. In their effort to create a plan for a new youth advisory committee, they’ve reached out to several local organizations, youth and the employees with the CYA, conducting interviews and focus groups on behalf of the CYA in order to get community input. The community problem-solving course at Renaissance College is a capstone course where students are partnered with non-profit, government-sector, NGO, and business organizations, and given the opportunity to transfer and apply knowledge learned from course work and their domestic and international internships to the local context. Students in the course aim to bridge the worlds of academia and community, building skills beyond the classroom while completing a rigorous research paper. The students are quick to add that they’ve also benefited from the learning experience. “We have all been very impressed watching how the CYA works to listen to the needs of youth and ensure that all youth have access to proper services through the continual monitoring of laws and policies, and reviewing of availability, effectiveness, responsiveness, and relevance of youth services in New Brunswick,” said group member Colford. Their efforts will be communicated beyond the Office of the Child and Youth Advocate and the classroom and extended to the general public in a community symposium. Carlson, Pelletier, Daley and Colford will present their proposal and the work they’ve done with the CYA at the 2016 Renaissance College Symposium on Social Impact on March 22. The symposium will take place from 2:30 – 5:30 pm in room 143 of Marshall d’Avray Hall on UNB’s Fredericton campus. Symposium presentations will address a broad range of topics of both local and provincial importance that span complex problems as presented to students by organizations such as the Business Immigrant Mentorship Program/The HIVE, Sunrise Partnership for Agriculture Development and Education (SPADE), The Ville Corporative, Department of Post-Secondary Education Training and Labour (PETL), Public Health Dietitians/Department of Health, and the New Brunswick Agricultural Alliance/Department of Agriculture, Aquaculture and Fisheries. More details can be found on the symposium’s Facebook event page.